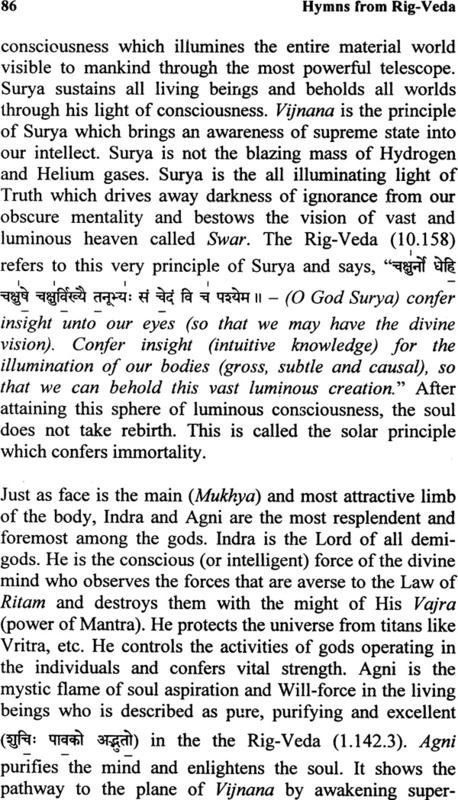 The Rig-Veda is the most ancient scripture in the world comprising of Mantras which were revealed to various seers in a state of deep meditation (Tapas). 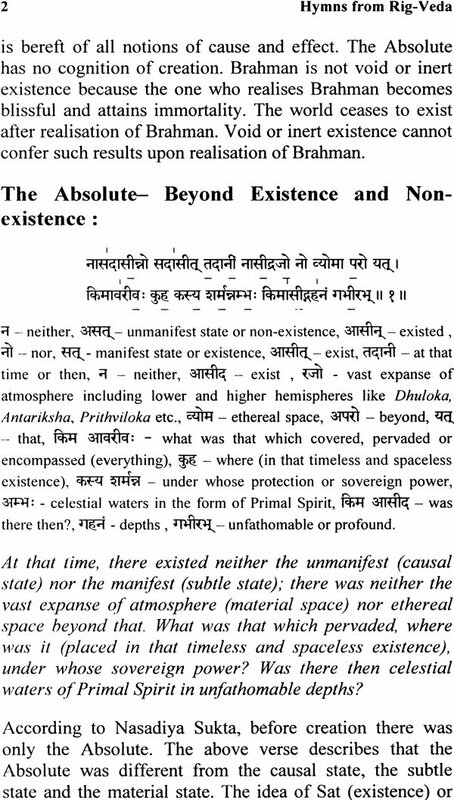 These Mantras abide eternally in the Supreme Ether (Parame Viyoman) and hence are without a beginning. These Mantras are not composed by human beings. There are about 10,552 Mantras which are grouped into 1028 Suktas (Hymns) and covered under ten Mandalas of the Rig- Veda Samhita. These Mantras reveal the super-sensory (intuitive) knowledge which cannot be acquired through the five senses of perceptions. However, this intuitive knowledge is revealed to only those who have purified their hearts through devotion in Truth. 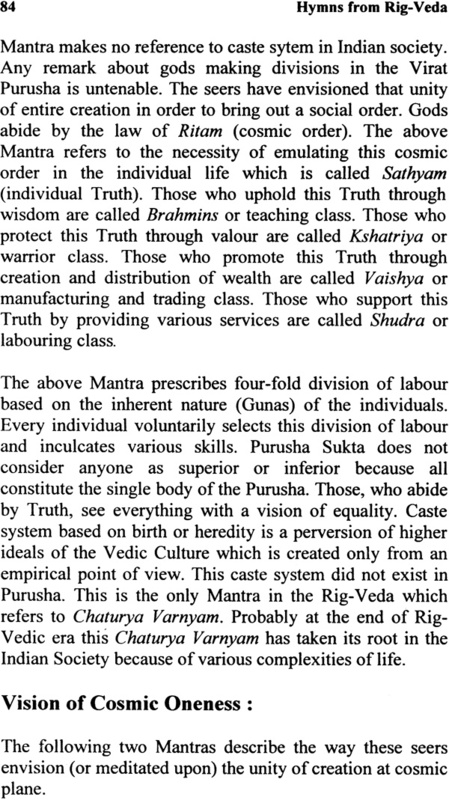 Those scholars, who have no devotion to Truth, do not derive real benefit from the Vedas by chanting Rik-Mantras and knowing their factual meaning. This book presents word-to-word meaning, English translation, and detailed commentary on few selected Suktas from the Rig-Veda Samhita. The aim of this book is to reveal the most fundamental doctrine of the Rig-Veda. There is only one Divine Power that is the basis of entire cosmic existence. This is the irrefutable doctrine of the Rig-Veda. This book will help the readers to comprehend the unfathomable depth of Vedic thought. The author is an Engineer by profession and holds a Masters Degree in Business Administration. Since his childhood, he has had a deep interest in Indian Spirituality. With the grace of his Guru, he experienced a state of Samadhi during his college days. Thereafter, having got disillusioned with secular knowledge, he decided to dedicate his life in search of the ultimate Truth. Presently, he is residing at the Ashram in Prasanthi Nilayam, the abode of Bhagavan Sri Sathya Sai Baba. He is leading a holy life and rendering services at the Ashram. 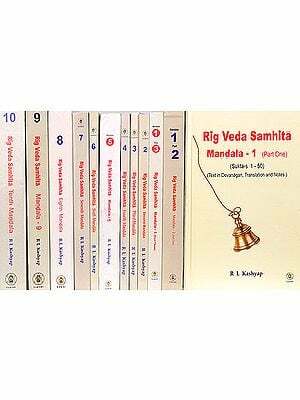 With his rich experiences derived under the guidance of several spiritual luminaries, he has been disseminating the knowledge of Sanatan Dharma for more than two decades by writing commentaries on Veda and Vedanta. The Vedas are the books of revealed knowledge, a knowledge which cannot be acquired through sense perception using logical and reasoning intelligence of the mind. This knowledge was revealed to the Rishis (seers) in the state of deep meditation (Tapas). This knowledge is super-rational and intuitive which forms the basis of all mystical or spiritual knowledge. 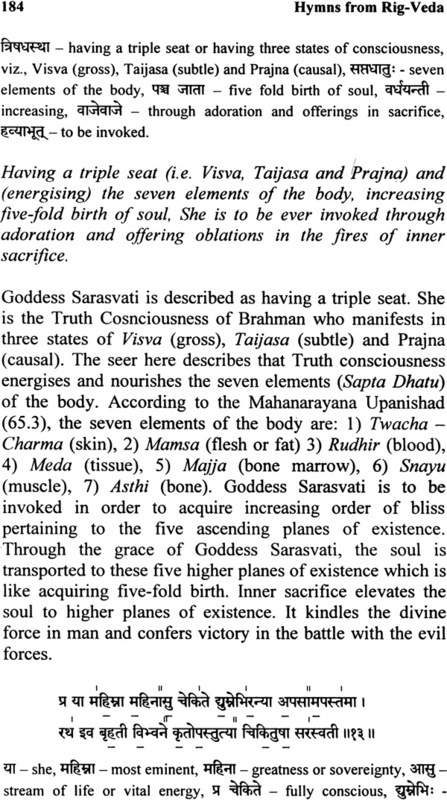 There are four Vedas, viz., Rig, Yajur, Sarna and Atharvan. 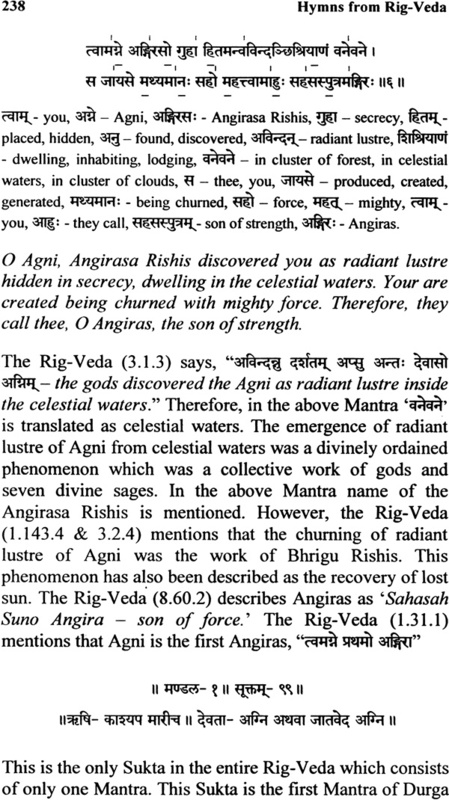 The Rig-Veda is the most ancient among all the four Vedas. Each Veda has been divided into four parts, viz., Samhita, Brahmana, Aranyaka and Upanishad. 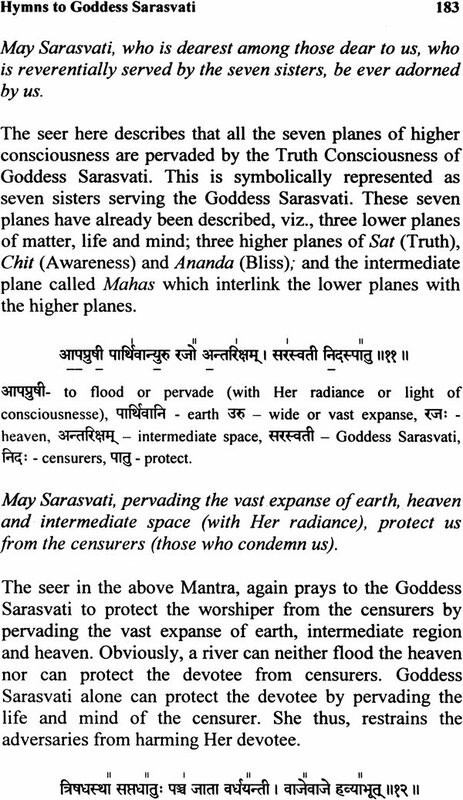 The Samhita portion of the Vedas contains Mantras addressed to various deities. 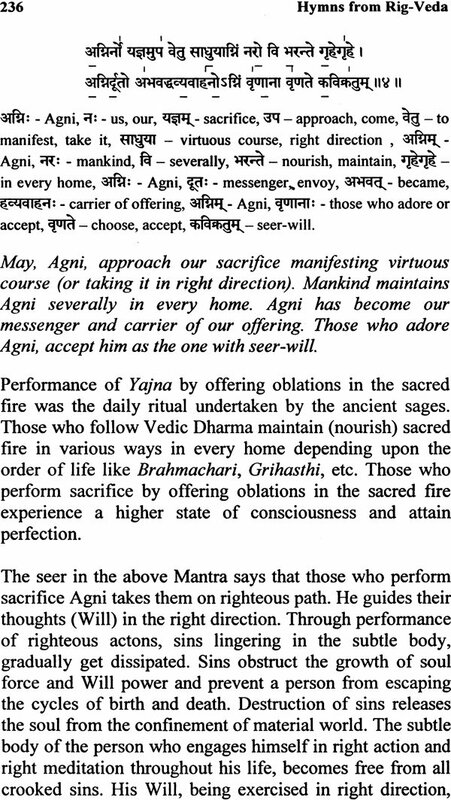 The Brahmana portion prescribes the procedures for daily rituals and worship. The Aranyaka portion of the Vedas lays down rules and regulations for forest dwellers. The Upanishad imparts the knowledge of the Self. The Rig-Veda Samhita has 10,552 Mantras contained in 1,028 Suktas (collections of hymns) which are spread over ten Mandalas. Each Mantra is in a particular meter and associated with a deity and a Rishi to whom the Mantra was revealed. A Mantra is a mystical formula which embodies the very form of the deity and carries the power of the deity in it. A Mantra contains sacred words which, when chanted with proper intonations, brings into awareness the wisdom and workings of the deity. A Mantra is infused with the power of Tapas of the Rishi to whom it was revealed. A Rishi is a Mantra Drasta who has had a vision of the deity through Tapas. 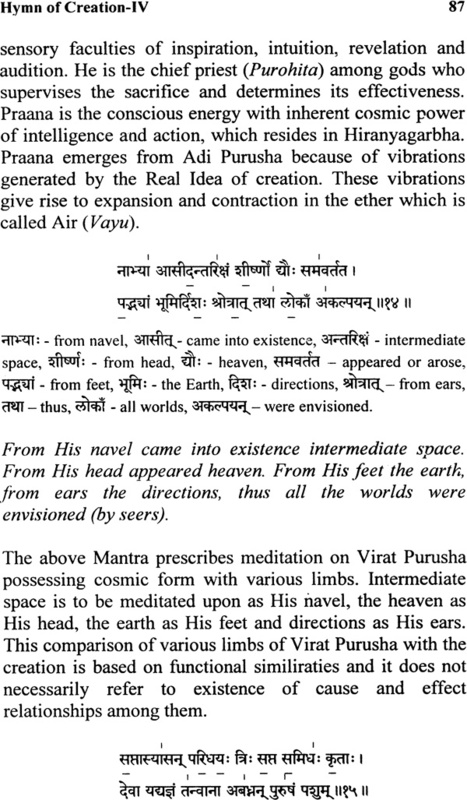 These Mantras were received by Rishis through revelation of knowledge from the supreme heaven called Parame Vyoman. They sang the praises of the deity in seven meters or rhythms that came vibrating to them from the supreme heaven. They coined the Mantra through their poetic skill using the appropriate language and symbols as per the tradition prevalent at that time. Dristi (super-sensuous perception) and Shruti (super-sensuous hearing) are the two fundamental characteristics of the Vedic Mantra. 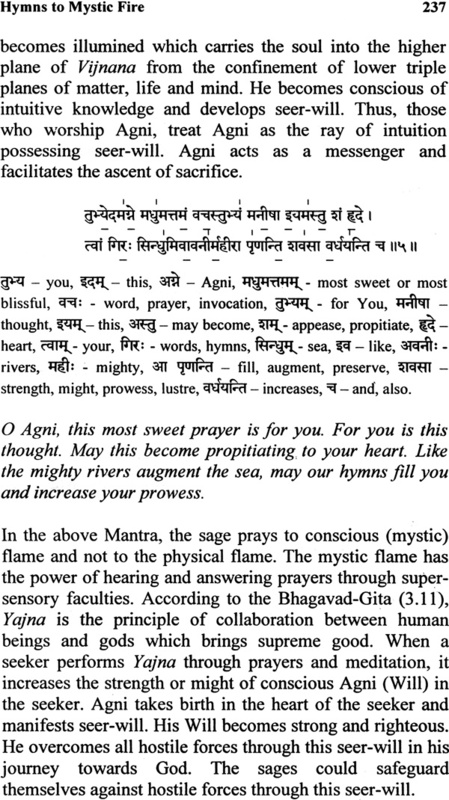 Mantras are not ordinary poetry as composed by many famous poets in Sanskrit. 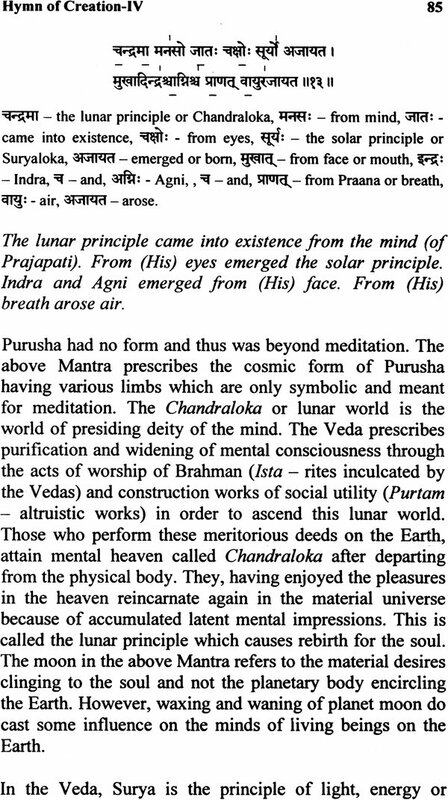 Thus, the Vedas are not composed by human beings and hence called Apaurusheya. The message of the Vedas is not limited to any particular caste, creed or religion. This message is universal and eternal. The Vedas are without a beginning (Anaadi) because these Mantras abide in the supreme ether eternally. Rig-Veda Samhita is considered as a repository of spiritual knowledge. 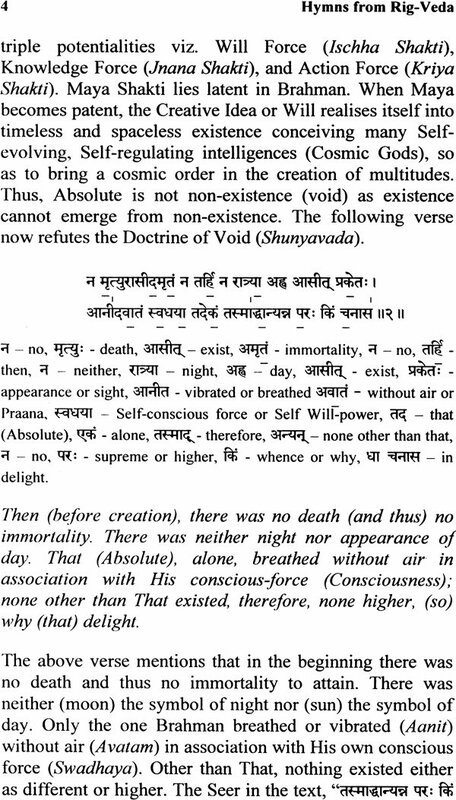 According to Yaska, the earliest commentator, Vedic Mantras have three meanings, viz., Adhyatma, Adhidaiva and Adhibhuta. Adhyatma conveys intuitive, spiritual or esoteric meaning. Mantras convey an inner import which is concealed in a cryptic language and often takes the form of symbols. Adhidaiva relates to the deity and conveys ritualistic meaning. Devout people, accepting this ritualistic meaning as the true import of the Mantra, praise deities through hymns in order to attain fulfillment of their wishes or desires. Adhibhuta is related to physical matter both in subtle and gross forms and conveys superficial (external) meaning. 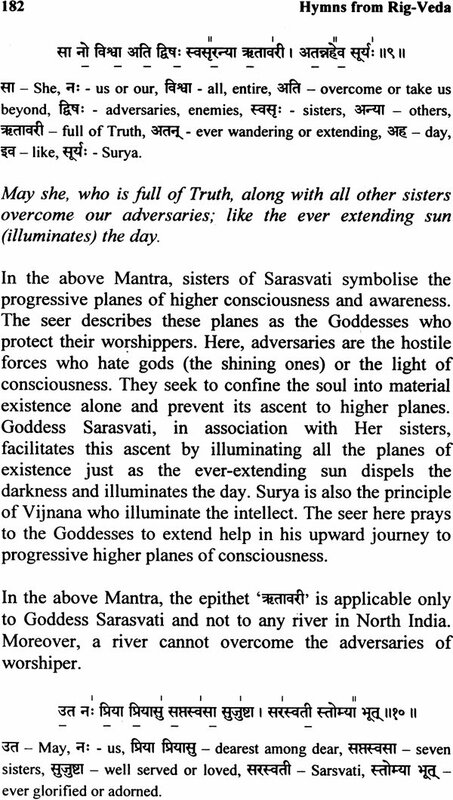 This external meaning has led to a naturalistic interpretation of the Vedas. It is the Adhyatma or the esoteric meaning of the symbol that reveals the secret of the Veda. This book presents the English translation and commentary on the few selected Suktas of the Rig-Veda. It is said, the Vedas are infinite". It is not possible for any human being to acquire this infinite knowledge of the Vedas. This book presents the most fundamental doctrine of the Rig-Veda which forms the basis of various schools of Spirituality. There "is only one Divine Power that is the basis of entire cosmic existence. The aspirants of spiritual knowledge will realise in this book that this fundamental doctrine of the Rig-Veda is irrefutable in spite of all scientific advancement. The Rig- Veda has Mantras addressed to various deities. However, the origin and goal of all deities is one. All deities perform their respective functions in accordance with the Law of Ritam. They represent the various powers of supreme Godhead. Supreme reality is One. The seers have described the various powers of supreme Godhead through many personified names (like Indra, Varuna, Surya, Soma, Vishnu, etc.) but in the end, they reveal the identity with the Supreme Godhead. Sage Dirghatamah Auchathyah in the Rig-Veda (1.164.46) finally reveals the universality of all deities and says, (Ekam Sat Vipra Bahuda Vadanti) Truth is one alone. The Wise ones describe it variously through many personified names." 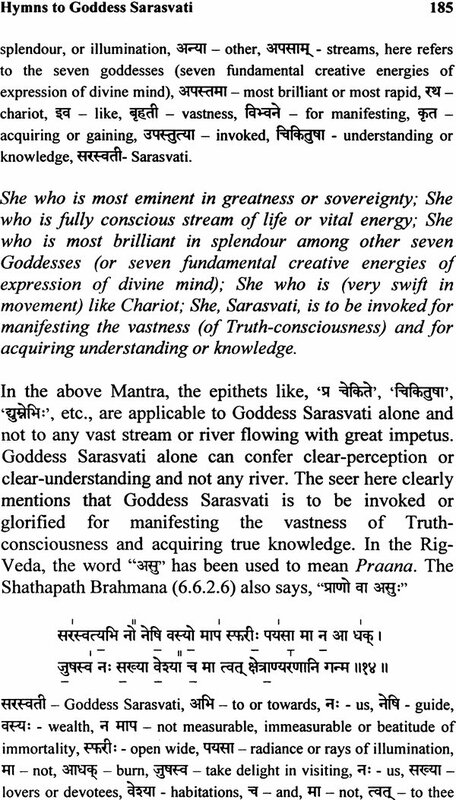 This, fundamental Truth alone is the real Veda. I am grateful to His Holiness Jagadguru Sri Sri Bharati Tirtha Mahaswarniji, Sri Sri Jagadguru Shankaracharya of Sringeri Sharada Peetham for showering His grace upon me. Without the grace of His Holiness, this work would have been impossible. I express sincere thanks to my colleague Sri R. Srinivasan for editing the manuscript and providing valuable suggestions. I also wish to thank Sri G. Vigneshwaran for designing the cover of this book. May the Supreme Self, who resides in the hearts of all beings, be pleased with this humble effort.